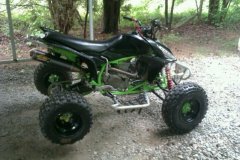 ok well as of now i have an 05trx450r but ive been seeing alot of raptor 660s out there and i cant help but wonder if there the best for the riding i do i do ride tracks every once and a while some if my friends have tracks but i mostly ride trails and the 450 is not the best on the trails ill be the first to admit i love it and its stupid fast but not very good at going slow so i was going to try and get some input on whether or not i should get a raptor or keep my 450?? 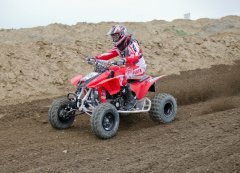 Honda 450R is awesome, but I hear a Raptor 660 is a beast! * Added manufacturers to thread title and moved to This vs. That forum. 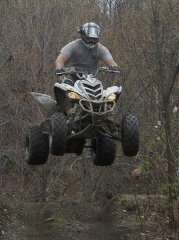 if your going to get a raptor go with the 700. its faster and more stable in the turns. the 660 s feel like your riding a dirt bike. the 700 is wider and had better suspension. the fuel injection is nice too . don t have to worry about jetting. I`m stickin with my R !! We ride trails here and it does just fine ! No doubt, keep the 450. If we had a dollar for every time the question “Which is really faster, the 700 or the 450?” shows up in our inbox, mailbox, or voicemail, we’d be putting this magazine together from a bungalow on a barely inhabited tropical isle named Quadhama. So i recently bought a Honda TRX 450r 05 kick start model i am the 3rd owner. this bike ripped when it was running but i ceased it.I freed up the piston but there is little compression now. i think i ran it out of oil but it was like 20hrs or so since the last oil change. My real question is that i heard you have to rebuild the top end every 15 hours is this true? Now i have bought a new big bore kit to replace the cylinder and the piston but i dont really want to have to rebuild it every 15hrs.